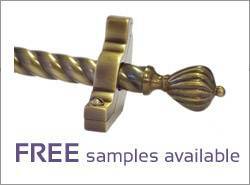 Our carpet rods are made to measure to ensure that you get the perfect fit. The length of your rod will depend on the choice of runner or fitted carpet you have chosen and the type of bracket fixing (runner, front or side) you would prefer. Please specify the length of the stair rod you require from tip to tip, including the finial. Not all of your stairs will be the same width. Even on straight stairs, a newel post or other obstruction can affect the space available between the edge of your runner and the skirting board or spindles, so feel free to order shorter rod for one or more of your stairs. In fact, if necessary we will cut everyone to the required length you need. This will definitely need to happen if you have winding stairs, or a half landing, rather than straight stairs. The length of rod is based off either your runner width or the width of the entire stair if you have fitted carpet and our rods come in 3 different diameters so the table below offers a guide to calculating the correct length to order. Remember if in doubt please do call us, we would rather have three calls to get them right than have the awkward conversation that says we cannot accept returns because you might have measured incorrectly.